In the training sequence “the next lesson” is supposed to be a local area solo flight, build confidence of being out of sight of the airport and on my own etc. However, at this time of year, getting solo flight weather conditions is the same odds as winning the lottery. I’ve been cancelled 4-5 times over the Christmas period and I only drove down to the club for this lesson with expectation of getting cancelled and because it’s easier to re-book if you can see the diary in front of you. I was set to fly with what used to be my regular instructor, but recently it’s been a good few months since we’ve flown together. One look at my training log and the body language was as I’d expected and I reciprocated. With a cloud base at approx. 1,500ft going solo was completely out, but we could go and brush up the bad weather circuits (Flown at 600ft instead of 1,000ft). It’s still nice to think back that there was a time when if the cloud had been like this and the intent was to do circuits, I’d have been cancelled. Now at least there’s some confidence I can fly a low altitude circuit (600ft being only 100ft above the legal minimum height). 500ft : Two stages of flaps (Not “Flaps to 2” as I might have said in the breifing……Ehhh, 2, 20, 2 stages, it’s only a name 🙂 ). Level the aircraft out at 600ft and trim for 70 knots. Turn through 180 degrees (rather then flying crosswind as a straight line). The turn onto final becomes a 180 turn from downwind straight to final, due to being ~50% closer in on the runway. Roughly right, apologies if that’s not quite a complete briefing on the topic, I’d refer you to the book of words, but this lesson is not in the book of words….. I had my choice of planes, actually it seemed bizarrely quiet a the aero club today. Oh well, I’ll take my favorite plane G-SHWK, we’ve had a good run recently. All checks done I sat around in the plane for a few minutes, in the past a senior instructor has told me that post-solo I’m allowed to start the engine on my own. That’s one of those things I’d been looking forward to doing, but then I’ve gone so many lessons without the opportunity self-doubt has crept in and now I found myself reluctant. The log book says we did 8 of them, I’ll be honest I can’t remember the exact sequence of all of them and even if I could chunks of it would become repetitive and boring to read as is the way with basically flying round and round in ellipses. In the first climb out the sequence of things was a bit rough and the height shot through to 700ft, this would be a trend I’d find hard to break. Once trimmed up the height was recovered so that by downwind we were flying 600ft – though I look back and remember spending less attention on my airspeed for achieving this (a point the instructor would pick me up on). I’m going to paint a red line on the front of this plane, just left of the bolts above the engine cowling and straight to the propeller…..or something, even when I was trying to pick a field and flying straight to it I found myself moving my mental line (was it the bolts I’d lined up with the field or just left of them), correcting for the wind and/or the balance and then bang…..instead of flying 050 and heading straight for the landmark of the base turn, I was back on 030 converging on the runway. Being already 50% closer in on the runway then a normal circuit this convergence was pretty crap actually. It was something I just kept doing until I over compensated and diverged on a circuit. Oh I wish I’d never emphasised the fact I believed I’d cracked my “rubbish” full flap landings. Right from the get go, first circuit I knew I was doing the last 50ft wrong, but I couldn’t stop it. Old instructor, all my old bad habits came rushing back to haunt me…….I felt my eyes staring too steeply down on the asphalt, I tried to stop that but my brain couldn’t resist a fear of losing all the airspeed in the flare, so I didn’t flare properly and wham, a hard landing. I did eight landings in this lesson, I hated all but one of them. None were so rubbish they forced a go-around, none were so rubbish you’d call them unsafe, but I hated them. I still hate them, I look back at this lesson and am really bitter about some of the stuff I was sub-consciously doing. It was like I’d reverted back to how I used to fly just because somewhere in my head I knew who was in the right seat. The landings were so rough that at the end of the lesson my instructor asked me to do a couple of normal circuits just because even she said she’d seen me do better then what was happening today. They were a bit better, maybe the last one was decent. But I have to walk away from this with my head screaming Arggghhhh!!!! I kept overshooting in the climb, this was not great but I’ll try and be positive and argue that you don’t typically go and take-off into bad weather, feel free to counter with arguments of go-arounds. Once the extra hundred feet was lost I felt I was doing a decent job of holding the height, I’d even say it was trimmed up…….but I was trimming for height holding. Quite rightly my instructor later flagged me that I was sometimes flying too fast, an extra 10 knots of speed making life more rushed then it needed to be. In myself I didn’t feel the approaches were bad, but as I’ve said above, the last 50-100ft my descent angle was to steep with not enough airspeed for that angle (my view of why it goes wrong). I’ve seen those speed dials and attitudes many times before, when it goes wrong the picture in the window looks like it did and the speed dials are reading 45-50 knots, if they read 55-60 and the descent angle was a bit more shallow then changing the attitude would not drop a ton of airspeed the rate of descent would be arrested, I’d have more confidence in myself to flare harder and touchdown would be feather like. This wasn’t my best lesson as you can tell, I wasn’t happy with a lot of what I was doing, but I am happy that if someone said “are you confident to fly a 600ft solo circuit” I could say yes without guilt or worry. Sure the landings were rough, but they weren’t unsafe and I know I can do them better, this was just one of those days where it didn’t quite happen. The fact I haven’t been able to fly since mid-December also probably played into it. 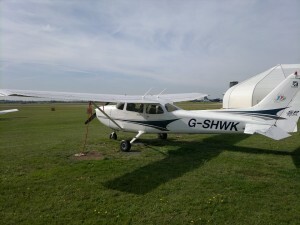 There’s a tick in a box, so it’s not all bad, my landings were good enough that my instructor said she’d have sent me solo with them – but I just know I can do them better then that and that’s why I’m particularly hard over on the issue. I’ll just keep looking forward to that elusive local area solo. This entry was posted on Thursday, January 10th, 2013 at 1:28 pm by PHC	and is filed under Actual Lessons, PPL Course. You can follow any responses to this entry through the RSS 2.0 feed. You can leave a response, or trackback from your own site.